We’re continuing our “KC-Review” project with Crestbook’s International Grandmaster Sergey Shipov answering questions from members of the KasparovChess forum. His answers cover the sporting, creative, organisational and other aspects of 2013, producing a comprehensive portrait of the year in chess. Discussion can be continued in a special thread of the Russian KasparovChess forum. The main impression was that records were broken for how packed the calendar was, with an abundance of strong tournaments. I can’t remember ever seeing as many important events as there were in 2013 - the Candidates Tournament, two World Championship matches, the Men’s and Women’s Grand Prix series, the World Cup, the World and European Team Championships and a huge number of strong round-robin tournaments, matches and normal tournaments. Besides serious chess there was also no lack of battles in rapid and blitz. A record number of games were played and serious contributions were made both to theory and the treasure trove of chess art. The year’s main event was, of course, Carlsen’s World Championship. We’ve witnessed the beginning of a new era in chess. Youth is on the rise and the veterans are taking a back seat. The way chess is covered is also changing. The TV format has become the new standard, with viewers brought as close as possible to the play. My assessment of 2013: A+! Let’s hope this is the beginning of a trend and not a flash in the pan. vasa: The most vivid chess moment of 2013? The last round of the Candidates Tournament in London: simultaneous time scrambles in Carlsen – Svidler and Ivanchuk – Kramnik. - The very best game of the year? Given the wealth of choice, and it really was an impressive year for chess, I can’t single out one game. I advise readers to choose the best themselves – from the ones I mention below. The five best combinations of the year? I wasn’t physically able to follow all the games played by tactically-gifted players. No doubt non-elite tournaments featured dozens of wonderful combinations, but all I can do is mention those fragments which stuck in my memory – making no claims to an all-encompassing survey. 1. Aronian – Anand, Wijk aan Zee (starting from 15…Bc5! – Rubinstein would have been impressed). There’s also analysis. - The three best positional games of the year? Vachier-Lagrave – Ding Liren, Biel (an exquisite game!). This requires an introduction on the theme, "what is a novelty?". The issue shouldn’t be approached too formally. It often happens that a rare move has been played a few times in an important variation but hasn’t yielded good results or caught the eye – and therefore the great and the good haven’t paid any attention to the move. Then one of them studies it seriously, plays it, reveals the true ideas in the position and achieves a result (for instance, an opening advantage) – and then it actually is a valuable novelty. A real one. 5.e3!? with the idea of Ng1-e2. - Brilliant preparation in the Petroff, starting with 21.Rae2! - Two endgames of the year? Anand - Carlsen, Chennai, Game 6. They were what decided the outcome of the match. - Draw of the year? - Move of the year? It was a year rich in memorable moves. The best known, boldest and most debatable was Carlsen’s 28.e3 against Anand in the third game of the match in Chennai. The annotations commentators awarded the move ranged from !! to ? – and the debate goes on! I’ll try a different line of argument… Firstly, the move 28.e3 is bad on general considerations. White has boxed his own queen into the corner of the board, transforming it into the bishop’s shadow – and after that he opens lines in the centre in such a way that Black’s passive dark-squared bishop is activated. White immediately has clear weaknesses on b2 and f2. A whole host of drawbacks! How will it be possible to teach children positional play in future if it’s going to amount to such decisions? The thing is (and this is the second point), Pavel didn’t explain why this exception to the positional rules was forced, as after all, his analysis didn’t show why anything else was bad for White i.e. even if White survives with accurate computer moves after 28.e3 that’s far from meaning it was the best approach. Thirdly, from a practical point of view. You have to admit that 28.e3 ... isn’t going to qualify as the “simplest” path. At that point Magnus had less time on his clock than Vishy. If he knew for certain that Anand would refrain from the moves that were sharpest and most dangerous for White… But even so! Perhaps that was Carlsen’s assumption, as it’s unlikely at the board he could have seen even a fraction of the lines later found in analysis, but in that case you can talk about a successful bluff, but not the best chess choice… As for alternatives to the move 28.e3 – there was no lack of them (no. 1, no. 2, no. 3). - "Blunder" of the year? I’d widen the question from "blunder" to mistake of the year. I’ll name three. 1. Grischuk’s liquidation into a lost pawn endgame in his game with Kramnik (London Candidates Tournament) made quite an impression. 2. The even more significant mistake by Black in Ivanchuk – Kramnik, London Candidates Tournament. i.e., 35...Rc8? instead of 35...Rxa6 36.Rxa6 Nf4+!, which could have given the Russian the right to play a World Championship match. 3. The third notable mistake: 40.Qd4? in the encounter Yu Yangyi – Nepomniachtchi, Antalya (World Team Championship) – that meant Russia maintained medal chances. White’s mistake 40.Kf2? in Grischuk – Caruana, Paris Grand Prix, which was already mentioned above. Probably 21...Qb8? in Anand – Kramnik, Zurich. Тянь-Викунтяу: The most "unusual" or "strange" game of the past year? Radjabov – Carlsen, London Candidates Tournament. Regulus: Opening preparation/discovery of the year? I was impressed by the system that brought Grischuk success in his games against Nepomniachtchi at the ACP Tournament in Riga, i.e. the new Anti-Grünfeld: 1.d4 Nf6 2.c4 g6 3.Nf3 Bg7 4.e3!? 0-0 5.Be2! The Reti Opening made very strong progress over the year. The attitude to it has also changed. Those playing Black have realised that things aren’t so simple and that in fact they don’t have as wide a choice as they previously thought. You can’t play it by ear – you need to do serious work and learn a lot. Overall, a fashion has now arisen for rare variations. Everyone has had enough of cramming up on computer analysis. Everyone wants to play and win like Carlsen! For example, he played the Ponziani (against Harikrishna in Wijk aan Zee) – and he dragged others in his wake. MS: The "shutdown" of the year – the most significant theoretical result putting an end to an important opening branch? The most significant phenomenon of the last few years has been the Berlin Variation, putting an end to nothing less than the move 1.e4. This year we’ve had another N new proofs of that "shutdown". And that’s what matters most. In the Queen’s Gambit Black has started to experience serious problems after 1.d4 d5 2.c4 e6 3.Nc3 Be7 4.Nf3 Nf6 5.Bf4 0-0 6.a3!. The Kazan syndrome (dating from 2011) has been overcome. Therefore Black is now trying his luck in variations where he brings his knight to d7 early on while his bishop is still on f8 i.e. 1.d4 Nf6 2.c4 e6 (scaring White with the Nimzowitsch Defence) 3.Nf3 d5 4.Nc3 Nbd7!?. This position is as old as the hills, but naturally new ideas have been found in it. After 5.Bf4 Black confidently takes on c4 and then often develops the f8-bishop not to e7 but d6 – with very decent results. That’s a page of theory taking shape before our eyes. The verdict is as yet unknown. After the fiery game Aronian-Anand, Wijk aan Zee 2013, fans of the Anti-Meran as White have become despondent. In the Najdorf Variation of the Sicilian Defence Black is being pressed from various sides. Minor problems are appearing everywhere: from the modest 6.h3 to the main lines with 6.Bg5 and 6.Be3. Unfortunately (speaking from experience) Black also has big problems in the Rauzer Variation of the Sicilian Defence. But the Chelyabinsk Variation has had a fine year – and is gradually killing off the white attackers who were accustomed to responding to 2...Nc6 with 3.d4. They’ve been forced to look for slim pickings in systems with an early development of the f1-bishop to b5. In general, wherever you look it’s the same story – everything’s being "shut down" everywhere. Valchess: Coach of the year? Junior coach? Coaching is a dying profession. By that I mean individual coaching by coaches who devote the majority of their time to pupils and lead them upwards on the ladder to success. Working with a permanent coach has lost its significance and been replaced by players (even very young ones) working independently with a computer, or also working together with chess friends on opening systems – swapping experience and ideas in joint training sessions, and so on. There are fewer and fewer notable figures in that dying profession. You can single out Chuchelov (Caruana, Giri, Abdumalik), Dokhoian (Karjakin, the Russian team) and… it’s hard to continue the list. I can’t say anything about junior coaches as I barely follow junior chess. I’m just grateful if I manage to follow adult chess. Valchess: Young male and female chess players of the year? Wei Yi from China (who beat Nepomniachtchi and Shirov at the World Cup) and Zhansaya Abdumalik from Kazakhstan. - Revelation of the year. At the very top that’s no doubt Caruana, but what about those just coming through? No, Caruana is no longer a revelation. He was the phenomenon of 2012. In Europe you can consider Richard Rapport the revelation of the year, and in China, Yu Yangyi. In Russia Vladimir Fedoseev has really improved. All of them, however, still need to work their socks off in order to catch up with Caruana and the other chosen ones. - Female revelation of the year? Zhansaya Abdumalik. In women’s chess the difference between junior and adult chess is a little less clear than it is for men. Zhansaya has very easily crossed that divide, following in the footsteps of Aleksandra Goryachkina. Aleksandra was the heroine of 2012, while Zhansaya is the heroine of 2013. Valchess: Chess official of the year? A difficult question… I don’t want to name the old ones that everyone knows – many of them are already in need of replacement. For now no new "stars" are visible on the horizon. Plus in principle the less noticeable our officials are the better for chess. Блаженный_Поэт: Disappointment of the year? clear0004: Collapse of the year? Kramnik’s last place at the Tal Memorial Tournament. That was a real contrast to his performance at the London Candidates Tournament, where Vladimir was in the form of his life. - Sensation of the year? Andreikin’s qualification for the Candidates Tournament. Sure, Dmitry had already achieved excellent results in the previous year and had started to demonstrate mature play, but I would never have guessed he’d manage to qualify for the Candidates so quickly. That really was a sensation. Sad event of the year? The tragic death of Igor Kurnosov. - Scandal of the year? The amateur regulations for the London Candidates Tournament, by which I mean the rule some nameless person drafted in case of a tie for first place. Instead of a logical and sporting play-off we got… in general, we all know what happened. - Curiosity of the year? Geneva Grand Prix, when the Women’s World Champion was unable to mate with a knight and bishop. Off-the-board curiosity: Svidler, Karjakin and Radjabov pulling out of the last stage of the FIDE Grand Prix in Paris with impunity. - Off-the-board event of the year? Carlsen being thrown into the swimming pool after his victory in Chennai. Valchess: Nominations for the 2013 Chess Oscar? The full list of nominations should be long, but I’ll name a dozen: Carlsen, Kramnik, Mamedyarov, Topalov, Gelfand, Aronian, Karjakin, Andreikin, Svidler, Nakamura, Caruana and Grischuk. I haven’t got a clue who should be left out of the ten! stirlitz: Sergey, how do you rate Vladimir Kramnik’s play in 2013? Why were wonderful results (the World Cup, the Candidates Tournament) interlaced with complete collapses (for example, -3 at the Tal Memorial, getting crushed by Fressinet, suffering in his game against the Egyptians – and there are plenty more examples)? After all, he was never an unstable player. Does he have chances in a match against Carlsen? Instability is a consequence of the years he has behind him. As time goes by even such a high-quality player finds it harder and harder to maintain the level of concentration necessary during a game. The body fails to withstand continuous pressure and falters, regardless of the owner’s wishes. Kramnik, moreover, is now playing very aggressive chess – he’s taking risks, making sacrifices and being creative. Such a style widens the range of possible results. Kramnik does have chances in a match against Carlsen – as long as he does the necessary painstaking preparation in chess, physical and psychological terms. Vladimir doesn’t actually need to outdo himself to succeed. It would be enough to show the same form he showed in London 2013. However, for now that’s counting chickens before they hatch. Kramnik first of all needs to win the Candidates Tournament in Khanty-Mansiysk. His likelihood of success, in my view, is no more than 30%. 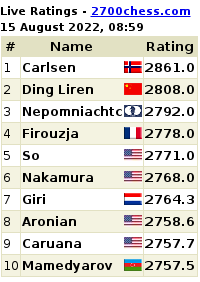 Valchess: Things didn’t really seem to come together for Levon Aronian but on the other hand if you forget about Carlsen his rating shows that he’s solidified his second place and increased the gap to third. Has he decided to settle for such an unusual arrangement? Overall the year wasn’t a success for Levon. His collapse in the Candidates Tournament and his early exit from the World Cup remain daggers to the hearts of Aronian’s fans. He played well in supertournaments, but that’s already become routine. Михаил первый: What is Fabulous Caruana still lacking in order to beat all-comers? Openings, endgames, psychology…? Perhaps he's not as fabulous as Carlsen. Caruana is probably the most diligent and hard-working chess player among the elite, but that’s not enough to "beat all-comers". Otherwise the Chinese players would already long since have occupied the whole chess Olympus. What does Fabiano lack? Perhaps talent. Perhaps luck. However, he’ll have chances to refute all my suspicions about a lack of talent. And, more likely than not, he’ll manage to make his peace with Lady Luck. She likes hard workers. Valchess: Boris Gelfand has once again confounded sceptics who for some reason greet his results with amazement. What’s his secret? The right approach to chess. Self-discipline and tireless work. But Boris really does have undisclosed secrets. How does he manage to build up all that energy for events at such an age? All the world’s intelligence services are struggling to find the answer right now, but Mossad is standing guard. Valchess: After a break Veselin Topalov has made a successful return to the very top. Will his rise continue? That’s another return that, as far as I can tell, has amazed many. For me, however, it’s their amazement that’s amazing. I’m not talking about people for whom the problem of cheating in chess has become a very painful one, but about critics with a more informed and cautious judgment who recognise the top quality of the Bulgarian player. The point is that Topalov has a very sharp and aggressive style of play. His extremism and maximalism is a double-edged sword. With the necessary energy and ideas in reserve Topalov can terrorise all without exception. But if his batteries are run down (as was the case two to three years ago) the level of his play noticeably drops. It seems Veselin has managed to overcome a middle-age crisis and learned how to prepare correctly for tournaments – to be able to unleash his full energy at the right moment. If he manages to do the same in Khanty-Mansiysk, if he prepares a store of opening bombs and if he gets in the mood to go all-out, then… Then nothing would surprise me! Any result is possible. The games between Topalov and Kramnik will be of particular interest – after such a long gap they’ll have to sit down at the board against each other again. I can’t wait! Valchess: Mamedyarov has once again established himself among the elite. Is a qualitative leap visible in his play? Yes, Shakhriyar is on the right track. He’s evolved from a nervous youngster who was inclined to daring play following the call of his heart into a mature man who’s able to subordinate his desires to the objective demands of the position. He’s improved his openings and become stronger mentally, while talent was never something Shakhriyar needed to worry about. And so the results have followed! However, it’s unlikely Shakhriyar himself considers making it into the Candidates Tournament a phenomenal result. I think he has higher ambitions. Жак: Was Nakamura’s impressive victory in London a brief spark or the first ray of a new dawn? Is the change in his style a tribute to the northern fashion or is there still room for individual stylists (if only 11. Nxf7 in the final against Gelfand)? Nakamura has become very flexible and subtle in the opening. Following in Carlsen’s footsteps he’s started to pose his opponents difficult practical problems in rare lines. That’s increased the already monstrous strength of the American. Games against him have become a headache for many elite players – just think of Kramnik’s series of failures. Valchess: Peter Svidler is once again the Russian Champion, and he played very powerfully in a few other tournaments. Is something qualitatively new visible in his play? If you disregard a few new opening tricks, then… No, I haven’t observed anything really new in Peter’s play, but on the other hand I see he’s able to rejuvenate himself before the most important tournaments. The best proof of that was the Candidates Tournament in London. God grant Svidler grows another five years younger before Khanty-Mansiysk 2014. In that case, after once more becoming a pale youth with burning eyes, Peter will set the place on fire. dmitry_t: How do you explain the renaissance of Michael Adams? By the fact he’s a top-class chess player. When they’re in good physical shape such players often have "unexpectedly" good performances. Perhaps Michael has started to work out in the morning and go for jogs through the countryside? Or he’s switched to carrot juice? I consider such things sufficient to usher in a renaissance for Adams. Valchess: Sergey Karjakin had a rollercoaster year: who else had so many impressive victories in all possible formats – but at the same time he failed in a serious of strong tournaments and fell down the rating list. What’s going on? Is his dream of competing with Carlsen realistic? I think it’s a matter of psychology. On the whole Sergey is right up there. He’s a very gifted player who works a lot on chess – he has the support of sponsors, excellent coaches, training camps and so on. All the conditions for further growth! But in tournaments Karjakin often fails to make use of his full strength and commits unforced errors, or even visibly crumbles before an event’s over. By process of elimination there can only be one reason for his failures: mental black-outs and a malfunctioning nervous system. It’s too early to dream about Carlsen – for now he needs to think about Kramnik, Aronian and other participants in the Candidates Tournament. Perhaps in order to reduce stress levels Karjakin should keep repeating, "It’s not my cycle!" and then he’ll manage to follow in the footsteps of Karpov and qualify for a match against the new Fischer. Jacob: What’s behind Ivanchuk’s unsuccessful play in 2013 – particularly his disastrous performance at the Candidates Tournament? What happened to his stability? It seems the genius’ nervous system is utterly frayed. The strings have stopped sounding and one after another they’re snapping. In such a situation you can’t count on great results. His losing on time and occasional memorable play (it’s enough to mention Carlsen – Ivanchuk!) added drama to the Candidates Tournament. But no doubt it cost his fans millions of nerve cells. I think Ivanchuk will stubbornly bear his cross – and play on to his last breath. But he’ll no longer fight for the title. Jacob: What happened to Ponomariov - the former World Champion? Why don’t we hear anything about him? Why isn’t he invited to tournaments? Why didn’t he take part in the last World Team Championship in Turkey? Ruslan hasn’t gone anywhere. He plays tournaments regularly. For example, this year he took part in the FIDE Grand Prix series, the World Cup and so on. He simply didn’t shine. In team tournaments, meanwhile, Ponomariov didn’t play because, as far as I know, he was unable to reach an agreement with the Ukrainian Chess Federation. That’s an internal matter for them. WinPooh: The overall score for World Champions this autumn, based on the results of the two matches, was: +0 -7 =10. Has it just been that kind of autumn, or is something wrong with the world? I don’t think autumn’s got anything to do with it. It’s simply that the challengers, Magnus Carlsen and Hou Yifan, were at a point when they played chess palpably better than the champions, Vishy Anand and Anna Ushenina. So they swapped roles. Everything was logical and based on merit. WinPooh: A related question: how do you see the future prospects of Anna Ushenina and Viswanathan Anand? Ushenina will continue to improve. Her play will get better. It’s possible Anna will again fight for the highest title. She’s still young! Anand, meanwhile, is unavoidably becoming a veteran. His motivation and energy levels are getting lower and lower. According to recent reports he’s considering whether to drop out of the Candidates Tournament in Khanty-Mansiysk. That says a lot. On the other hand, Anand’s class and knowledge have gone nowhere. In a good mood and fine physical form he’s still capable of winning supertournaments, whatever the line-up. Grischuk. It was a great disappointment that Alexander didn’t qualify for the Candidates Tournament. He played well in the FIDE Grand Prix series, but fell a little short in the final tournaments. And then there was the Russian Chess Federation’s decision to give the wild card to Svidler… In general, it was an unsuccessful year for Grischuk, but the Muscovite is in the prime of his life, with many years ahead of him. It’s no time to get downhearted. Morozevich is a dramatic figure. The instability of that tireless experimenter and creative force has reached a high-water mark for his career. Before each new Morozevich game you can now simply toss a coin. That’s the most reliable way of predicting the result. Radjabov… After the tournament in London I was speechless. I would never have expected such a collapse from a young top-class player. Time, of course, heals. But that process doesn’t happen by itself. Teimour needs to work a lot on chess in order to return to the top. Everything depends on that alone. Wang Hao. It’s hard for me to judge. The epithets "young and wildly talented" should be a thing of the past. Time is passing! For the moment "Vanya" is confirming the old Chinese tradition according to which chess players from the Middle Kingdom knock on the doors of the elite, but the doors remain firmly shut. Giri is smoothly on the rise. He’s gathering small positional advantages and gradually ripening for a serious attack. Perhaps in the following year Anish will start to post serious results. Perhaps in a year’s time. But inevitably it will come. Kamsky – a decline was noticeable in his play. Gata has somehow been taking a mechanical, studied approach to his work. You can’t see any energy, or inspiration! His successful Grand Prix in Thessaloniki was a bright spot in the American’s year. But otherwise there was little to feel glad about. roman_l: Sergey Yurevich, based on the year’s results which young players are the most likely candidates to enter the world chess elite? Valchess: Dmitry Andreikin wasn’t as stable as last year, his rating progress wasn’t impressive, but he succeeded in the key tournaments. Was it merited? Is progress visible? At such a young age and with the right approach to chess progress is almost inevitable. Andreikin really is growing, and due to the resilience of his nervous system he’s managing to shine just when it’s most necessary. I don’t think Dima is realistically yet among the top eight players (let’s leave Carlsen in brackets), but he earned the right to play in the Candidates Tournament. Qualification is qualification! And if those who were objectively stronger let themselves down at the critical moment and didn’t show their best qualities in the World Cup that’s their fault. And well done, Andreikin! In chess, as in any other sport, the main thing is the result on the board. The Saratov player’s weakest spot remains his creative solitude. At the very top level it’s impossible to achieve success without seconds and heavy digging in the opening. I hope Dima has realised that and will prepare for Khanty-Mansiysk with a team. Valchess: Could you sum up the year for Tomashevsky and Jakovenko? And how did the year go for the most promising youngsters – Artemiev, Fedoseev, Goryachkina…? Well done to Tomashevsky, who shone at the World Cup! But overall Evgeny remains in something of a crisis. It seems he’ll lose out to younger rivals in the battle to play in the Russian team. Jakovenko adopted Stirlitz’s method. The last phrase of a conversation really is the one that’s remembered most, and in a year it’s the last performance. The Russia Cup was a triumph for Dmitry. But, as with Tomashevsky, it’ll be hard for Jakovenko to return to the team. Time is against him. Artemiev is still too young but we await future successes. I’ll also answer an unasked question about Vitiugov and Inarkiev. They both illustrate the saying "slow and steady does it". Nikita had a successful year. His big achievements can’t be missed (Gibraltar and the Russian Championship Superfinal), his play was of high quality (I recommend studying his games) and he made numeric progress (his Elo rating on 1 January 2014 – 2737!). At the same time the St. Petersburg player remains overshadowed by the stars of Russian chess. He’s underestimated and little spoken about. The reason is Vitiugov himself. He doesn’t play as boldly as other talented young players, but that’s not the main thing. Nikita is modest and well brought-up. He doesn’t give dramatic interviews or try to draw attention to himself. He simply works on chess and plays well. In general, he’s a model worthy of imitation. Valchess: Ian Nepomniachtchi finished the year on a high note (the Russian Championship and the World Team Championship), but up until that point he’d managed to play on the nerves of his numerous fans. Will it ever end? Or is it just in his make-up? Ian is how he is and it’s unlikely that will ever change dramatically. He’ll add solidity to his play, of course, as life will force that on him, but nevertheless, the speciality of the young Bryansk wolf will remain aggression and bold, creative ideas he found himself. So life wasn’t, isn’t and won’t be easy for fans of that temperamental player. He won’t let them get bored either. vasa: What’s the point of Nepomniachtchi seconding Carlsen? Working on the openings and having a friendly relationship, which is something many young professional chess players lack. If Magnus worked with a chess player from another generation he’d only get the first, but here both aspects are successfully combined. ChallengerSpy: Does Nepomniachtchi agreeing to help Carlsen suggest that Ian isn’t planning (long term) to compete with Magnus for the World Championship title? Kramnik helped Kasparov in the mid-90s and you’ll recall that ultimately they played each other for the title. And that’s not the only example. Working with the world’s best chess player is unquestionably beneficial for Ian. I’m sure he’ll derive a lot from it for himself. And already has. When he sees a dry, almost drawn position he remembers… a good friend of mine would win it. And he tries to do the same himself! Gevorg: Sergey Yurevich, how do you rate the past year overall for Daniil Dubov? What conclusions were drawn by Danya (and you!) right after the match with Shirov? What went right, and what’s still to be done? kambodja: Does Daniil’s disappointing result force us to look for a new talent, or do you consider that result the kind of necessary slap in the face that spurs you on to further progress? In some positions Danya was better, but instead of sharp moves he made insipid, "solidifying" moves, which saw good positions unnecessarily crumble. Will you try and work on that issue? Or can nothing be done – it’s just his style? It ended up being a tough year for Danya. Yes, we managed a breakthrough in the World Cup, which included defeating a gnarled veteran, but overall his progress slowed. That’s not the end of the world. Danya is studying a lot of chess, expanding his repertoire, grasping new typical positions and improving his endgames. At the moment he’s building up potential which will inevitably bring results in the near future. Conclusions were drawn from the match against Shirov. The games were analysed in great depth, so recurring themes were discussed and mistakes were identified… But you can’t really expect me to break things down any further – those are our industrial secrets. Of course risk was involved in playing sharp "Shirov" chess against Shirov, but who are you going to learn to play sharply and actively from if not him? The household name gave the young fighter a few painful but valuable lessons. Danya’s style will become smoother and more varied. At 17 years old you can still make a lot of tweaks, and even changes. Чик: What conclusions did you draw from the Dubov-Shirov match, above all about holding play-offs after a drawn game? Nothing but positives. On all six evenings it was interesting for both the commentator and the spectators. On all six occasions the day’s play determined a winner. It was a truly sporting match. Yes, officially the blitz games weren’t counted as part of the match outcome, although they were rated. But each of us has the right to treat the overall result as we choose – to look at the play-offs from our own point of view. For example, you could sum up the match by saying: Shirov won by a 14-4 scoreline. On the first and last day Dubov won 2-1 (the players get one point each for a draw in the main game and then another for winning the blitz play-off), while Shirov won 3-0 four times. I actually already described that approach with play-offs and the 3-point system. Yes, I know Alexei didn’t like the blitz play-offs, but just tell me which hockey player likes to play overtime after the tough regulation time of a match that finished drawn? Your whole body’s hurting and you have no energy left – but you have to go back out onto the ice and go for it. Or ask basketball players how keen they are to play overtime when they’re on their last legs. And do footballers like taking penalties in the 121st minute? Of course not. But in sport all of those extra trials are done not for the players’ benefit but to determine a winner. And for the fans. It should also be like that in chess. Valchess: Could you please sum up the year for the top female players in Russia and beyond. Who impressed? Who disappointed? Is there any hope of shaking the growing dominance of Hou Yifan? Among "foreigners" closer to Russia I’d single out Bela Khotenashvili – she made impressive progress over the year. I’m glad the Georgian school continues to produce strong female players. Mariya Muzychuk of the Ukraine is also growing before our eyes. She’s getting closer and closer to her star sister. Among "real" foreigners I’m following the Chinese women closely. I’m particularly concerned by the fast improving young Qi Gou, who I saw in action at the World Team Championship in Astana. She’s another addition to the host of strong female players in China. I think their line-up remains the strongest in female chess and they’ll be the main favourites for the Tromso Olympiad. Gunina had another fantastic season. She’s become our undisputed leader. Valya greatly improved in the opening and her play began to demonstrate variety and unpredictability. I hope her development will continue and then the sky (or rather Hou Yifan) is the limit. Kosteniuk has emerged from her crisis and it’s no great setback that she failed to fight for the top places in the Grand Prix series. It’s more important that she’s again playing without collapses. Her play has regained its old energy, which was particularly evident at the Russian Championship Superfinal and in the European Team Championship. Stability and energy make a good basis for a new rise. Pogonina had an average year – she didn’t dazzle, but she didn’t dismay either. She confirmed her high class without winning any titles. It’s good that Natasha is gradually collecting the scalps of the very best female players and overcoming previous complexes. Now she can focus on the decisive games and calmly play chess, regardless of how imposing her opponents are. Keep it up! Tanya Kosintseva didn’t have her best year and failed to live up to expectations. It was particularly surprising to see her failure in the Superfinal, where the performance simply wasn’t up to Tatiana’s level. Girya didn’t dazzle this year. On the other hand, she established herself at a high level and got used to the raised demands. Taking part in the Grand Prix series was a good school for Olga. She still has potential. Goryachkina finally played for the Russian team – that was the main event for her. And note that I’m talking about a girl who became the U20 World Champion in the same year! But Sasha has already made us so accustomed to her success in junior tournaments that the new and even heavier medal no longer made an impression. It’s time for her to post serious results in adult chess. The time has already passed for making allowances for age. I’m sure that’s precisely how Goryachkina’s coaches are motivating her. Bodnaruk and Kashlinskaya also made a good impression. The girls are improving not by the year but the month. Nastya and Alina provide good back-up for the team. As for Hou Yifan – she doesn’t look like an unconquerable monster. It’s possible to compete with her. Yes, she convincingly won the World Championship match – but that was no surprise, and the score didn’t correspond to the difference in strength. If the match had been played in a different country Ushenina would have collected more points. phisey: In "Snowdrops vs Oldhands" matches the level of play isn’t high, but they’re held regularly (recently there was such a tournament in Podebrady). Is it beneficial to play such matches between women and veterans? Everything that interests spectators or is written about is beneficial. These matches are excellent for popularising chess. Both the women and the old guys face a lack of good tournaments, so why not solve that issue in one fell swoop? It’s also nice that we always have sporting intrigue – the strength of the teams is well-matched. It’s undeniably useful for the girls to learn from the greats of the past, while they also have a chance to beat them. In general, I’m in favour and long may the banquet continue. Pavel_L: The event of the year? It strikes me the question clearly comes down to the Candidates Tournament or the Anand-Carlsen match, but which would you choose? The Candidates Tournament was head and shoulders above the World Championship match in all regards. It was one of the most, if not the most, interesting tournaments in the history of chess. We won’t forget it for a long time to come – particularly if decent authors devote tournament books to it. I’d be happy to undertake such a task myself. Valchess: The Anand-Carlsen World Championship match disappointed many – above all due to its predictability and the absence of a real struggle. Is that a fair impression? What will remain in the "historical" memory from the match? Yes, a sense of disappointment remains, but that was inevitable. In the current situation, where the World Championship system is still like using a sledgehammer to crack a nut (the privileges of the chess champion are simply unthinkable in other sports), there’s always the risk of such a situation arising. The Champion held the title and even defended it – but at the same time for many years he hadn’t won any tournaments and was very far from the top of the rating list. Historically speaking, the match will go down as a formality. The world’s strongest player came and easily claimed his legitimate title. The real World Champion became the official World Champion. Pavel_L: Do you have any guesses as to who seconded Carlsen apart from Hammer? And is that important? Taking into account modern computer resources and Carlsen’s style, would he be able to dominate in the near future while working alone like Fischer? No, Pavel, I’m not interested in any espionage work to discover Magnus’ seconds. I expressed a couple of bold hypotheses in the KC forum, so I won’t repeat myself. Whoever helped Carlsen did a good job. Their guy was no worse than Anand in the opening, which was a 100% guarantee of victory in the match. After all, in independent play the level of the players clearly differed. Yes, Magnus is now capable of winning supertournaments even if he works alone, but as a clever guy he won’t do that. The division of labour is the key to achieving success in all fields, and chess is no exception. The player needs to rest, sleep and move around, while the thankless task of digging around in openings – work which grows by the year – is a matter for seconds. Now, after the match, Carlsen will probably renew his cooperation with Peter-Heine Nielsen. Plus Hammer, plus those unknown helpers during the match – it all adds up to a solid team. P.S. Fischer also wasn’t alone for important matches and tournaments. He had helpers and seconds. WinPooh: A question on Carlsen. From the point of view of sporting results 2013 was Magnus’ most successful year – victories in London and Chennai speak for themselves. But what can you say about his purely chess and creative achievements? How is his style evolving? Put more simply, for the period in question did he play one or a few games for a future multi-volume "My greatest chess accomplishments"? Yes, Magnus also had creative success. For example, his game against Karjakin in Wijk was a peach! You could boldly include that in any book. Incidentally, that game impressed Magnus himself so much that he almost paid the price for copying his methods there (the same queen on h1 and the same e2-e3 break) in the third game of the World Championship match. You can also make out an evolution in his style. Carlsen has started to slightly abuse the method of sucking the life out of play, knowing how strong he is in technical positions. I hope that now, after claiming the title, the champion will be liberated and start to play more lively chess, adding some tactical sparkle to his play. Now’s not the time to become set in stone. TischenkoV: "The best chess masters of each era were closely bound to the values of the society in which they lived and created. All the changes in the cultural, political and psychological backdrop were reflected in the style and ideas of their play" – so wrote Kasparov in his book "My Great Predecessors". I’d really like to hear your opinion on Magnus in the context of that quote. Carlsen probably isn’t an exception to that general rule, but he doesn’t serve as a strong illustration of it. Magnus is a self-sufficient introvert for whom his own views are much more important than what others say about him. Many social "values" don’t have any bearing on him. Therefore that self-sufficient and extremely successful young man can allow himself to be however he wants. Even in spite of the rest of the world. vasa: How many years will Magnus Carlsen sit on the throne? I can tell you exactly – until he loses a match. That might happen in the coming year (2014). If Vladimir Kramnik wins the Candidates Tournament and then plays the match at the same level he demonstrated in London 2013 then a change on the throne is perfectly likely. Carlsen should also expect trouble from Aronian, who’s now in his prime. The chances of the other candidates are probably lower, but in a short one-off match surprises are always possible. If instead we’re talking about the average level of play, then Magnus will remain the best for at least another five years. And then – who knows! clear0004: Carlsen’s on the throne. Does that mark the dawn of a New Era in chess or is it too early to speak about that? Yes, it does. A change of generations in the top echelons of chess is taking place right before our eyes. Anand, Gelfand, Ivanchuk and even Kramnik are gradually losing out. Carlsen, Karjakin, Caruana and other youngsters will squeeze them out – which is as it should be. WinPooh: Can Carlsen attract truly major sponsors to chess – such as Microsoft, Intel and IBM during Kasparov’s times? Or are his contacts with the business world limited to his own advertising contracts with popular fashion brands? That depends exclusively on Carlsen’s own attitude. Will he be socially active and consciously act as the leader of our "trade union"? Or will he work only for himself? To be honest, I’m inclined to go for the second option. But that isn’t, actually, so bad. After all, Carlsen – a young hero who already has media traction – can’t play chess against himself. One way or another it will be better for the whole elite if more and more money is allocated for tournaments and matches "for Carlsen". It was like that in the times of Fischer (remember how Spassky called him "the leader of our trade union"?) and the same can happen again now. АркадийХ: In the near future who will be able to compete with Magnus for the title of World Champion? Земляк из Мурома: Do you think any of the participants in the upcoming Candidates Tournament will be capable of realistically competing with Magnus? АркадийХ: A completely different question! Who can beat the Magnus of 2013 and become World Champion? Or has such a person not yet been born? There are three or four players with realistic chances of defeating Magnus in a match (Kramnik, Aronian and a couple of grey horses), but the likelihood of the champion winning any of those matches is higher than 50%. As for a player who can overall be stronger than Carlsen… For now I don’t see one. By that I mean he’s probably already on Planet Earth, but so far he’s still running around in short trousers. Жак: Who’s stronger – Carlsen or the fear of Carlsen? In particular, in Nakamura’s case. The fear of a rival with superior strength is a constant factor in any struggle. Anand himself suffered in the match due to his own emotions and doubts. The same fate will await many others. In order actually to beat Carlsen you first need to beat him mentally – in the clash of personalities. It was the same for Kramnik with Kasparov. Volodya was able to defeat his fearsome opponent on the mental level – he wasn’t afraid of Garry as others were. That meant he had chances in the actual struggle. So the future challengers need to model themselves on the Kramnik of the late-90s. Valchess: The Hou Yifan – Ushenina match was even more one-sided. How do you rate the outcome, the quality of the games and the organisation (the latter provoked a lot of protests)? Or is it simply that Hou Yifan is head and shoulders above everyone else? Hou Yifan really does play better than everyone else in the women’s game. And in particular, she’s stronger than Ushenina. So the Chinese player’s victory was on merit. As for the organisation, it was obviously bad. Khalifman’s testimony is very eloquent on that point. Even if Ushenina handled the inconveniences three times better than her well-known second it was still a disgrace. I can understand that FIDE didn’t and doesn’t want to argue with its Chinese comrades, but leaving such things as a World Championship match entirely up to organisers with a great stake in the outcome is simply disreputable. It shouldn’t be like that. The quality of the games in the match was quite high, but only up until the point when Ushenina began to make bad blunders. vasa: Do any Russian players (or any players at all) have a chance of beating Hou Yifan? Yes, Valya Gunina has chances. Goryachkina will also be capable, though only in a few years’ time. And of course Zhansaya Abdumalik has potential, if she develops as she should. However, that’s just reflecting on possible confrontations in a serious match. In actual fact we’ll soon have a new knockout Women’s World Championship. There any specialist will be capable of knocking out Hou Yifan. In a two-game match, especially if the champion feels unwell (remember the Knockout Championship in Khanty-Mansiysk 2011) anything can happen, and against almost anyone. Valchess: How do you assess the performance of FIDE and its officials in 2013? For all its flaws the Candidates Tournament in London was magnificent. They just about muddled through with a scandalous last stage (letting three players pull out with impunity is a bad precedent), but nevertheless the Grand Prix series was brought to a conclusion and new candidates were determined. The World Cup took place. That also involved some controversial moments, but over time the flaws will be forgotten. The same applies to the Women’s World Championship. In general, the strong point of the current FIDE is that it holds tournaments as planned. The weak point is how it holds them. АркадийХ: Hello, Sergey! What, in your view, are the reasons for Kirsan Ilyumzhinov’s long stay in the post of FIDE President? What are his prospects? The reasons are Kirsan Nikolaevich’s iron health and that for many it’s financially beneficial that he stays at the top. In recent years FIDE has turned into quite a cunning commercial operation. It’s business. The other reason is that ousting a president elected under the "one country – one vote" system, and with an almost total absence of leverage for professional players to influence the election, is almost impossible. WinPooh: Is Kasparov entering the fight for the post of FIDE President a remake of Karpov’s campaign? How will his chances differ against Ilyumzhinov? Is it clear what particular changes Kasparov wants to bring with his team? How great a demand is there for those changes from chess society? I haven’t yet looked into the campaign promises of the pretenders to the throne. It’s not yet time. The only thing that stuck is that Kasparov will publish official documents not only in English but also in Russian, Spanish and French. You might dismiss that as a trifle, but it’s pleasant. However, it’s too early to say when it comes to important issues. On the one hand chess society has great respect for Kasparov. As one of its own. As a king of chess. At least he won’t permit amateur decisions to be taken when organising chess life. But on the other hand it fears the authoritarianism of the 13th World Champion. His fiery temperament remains a liability in such an important political post. As for replacing Karpov with Kasparov – that will intensify the struggle. It’s an order of magnitude harder to reach an understanding with Kasparov than with Karpov. It’ll be an uncompromising fight. Overall, Kirsan Nikolaevich’s chances of being re-elected strike me as greater than those of Garry Kasparov. When it comes to electioneering and negotiating Ilyumzhinov is a shark in his native element. Garry’s a scuba diver. phisey: What positive or negative shifts have you noticed in the running of the Russian Chess Federation this year? How do you assess the federation management and the coaching staff of the teams? That’s a large and complex topic. One impossible to summarise. I’ll single out just two points. The RCF’s approach to organising the Russian Championships strikes me as wrong in principle. What happened to the Higher League last year was a disgrace. They only organised it at the very last moment and moreover there was absolutely no hope of guaranteeing the participation of a good half of Russia’s strong players – such were the regulations and qualifying system. It was simply unprofitable for many grandmasters to play in the Championship. Any cheap Swiss open or simply sitting at home and working on chess would be a lot better. That situation needs to be improved, and as soon as possible. The Russian Championship needs to attract all of the country’s best players. For example, you could significantly reduce the rating barrier for admission to the Higher League. Or you could simply allow all title holders to take part. Then in order to get into the tournament grandmasters wouldn’t have to play in a preliminary qualifier against candidate masters. The significance of the tournament would be greatly enhanced, making qualifying for the Superfinal more competitive. As for working with the teams, everything there was top notch – the financing, the preparation and the work of the coaches. Well done! Valchess: It seems that after many years of complaints about a lack of tournaments we now have the opposite situation: there are too many tournaments, particularly for the elite. Mid-range grandmasters are also now always on the road. Does that mean we’ve finally constructed a system of tournaments at different levels and formats, particularly in Russia? To what extent can the overwhelming mass of non-elite professionals be satisfied with tournament life in 2013 – in general and in Russia? For the elite – yes, a golden age really has dawned. Among the oligarchs and simply rich it’s become fashionable to hold elite tournaments, and as a result the calendar has become overloaded. For average grandmasters and the second tier it’s all much worse. There’s no golden age, and none on the horizon. "Always on the road"? But is that a good thing? It would be much better to play tournaments rhythmically, alternating work and rest. But in that case it simply wouldn’t be possible to feed yourself and your family! After all, the conditions offered to grandmasters and masters for Swiss tournaments are on an inexorable decline. So the gladiators are simply forced to take on a quantity of tournaments that means that somewhere, somehow they’ll "catch" something worthwhile. You can also judge the reality from the tournament line-ups. Who plays in the Russia Cup? Who ultimately took part in the final in Khanty-Mansiysk? Yes, they were familiar players, but the line-up could have been much stronger. Again, as with the Russian Championships, you get a situation where grandmasters who aren’t in any case spoiled for tournaments find it difficult or disadvantageous to play. Valchess: Agon, the company run by Andrew Paulson, which last year was granted exclusive rights by FIDE to hold the World Championship and accompanying events (in particular, the Grand Prix) has somehow quietly receded into the shadows. Nevertheless, someone is organising the events and there are more private sponsors than ever. Do you know what on earth’s going on? First you need to get to the bottom of this notorious Agon. Why was it given such an honour? What conclusions were drawn from the obvious blunders and failures of Mr. Paulson? Was the contract torn up? Who’s organising the new tournaments and matches, and how? There are a lot of questions, but no-one to answer them. It was the same a year ago, and no improvement is visible. FIDE remains a closed organisation with mysterious undercurrents. On the other hand, the situation with private sponsors is cause for celebration. Let’s hope they continue in their noble cause. Valchess: Could you assess the main team events of 2013. Were the results fair? You can only look for fairness in all the results combined and not in individual performances. It’s clear the Russian men’s team is on the right track. With such a wealth of options when choosing players it’s very hard to come up with an ideal line-up. Hard, but possible, and that was shown by the World Team Championship. Yes, our rivals played without some of their leaders there, but that doesn’t take anything away from our players. The women’s team has also been pleasing. It’s very good that we managed to try out Sasha Goryachkina. When she gets accustomed to it and slots into the team she’ll provide serious reinforcement. WinPooh: Was the success of the Russian team at the recent World Team Championship just a consequence of the "law of big numbers" (we had to get lucky eventually after so many failures), or has there been a qualitative change in the team? The law of big numbers really is at work and this time we finally got lucky. But you also create your own luck. The team was prepared for the tournament, the country’s best players took it seriously and that meant we had real chances. You can already look to the future now and assess Russia’s Olympiad prospects. In August 2014 in Tromso we’ll see an all-out battle – with no favours from our rivals. Who’ll be in our team? I’m sure of three: Kramnik, Karjakin and Grischuk. With some reservations I see Svidler in the team as well. After all, we remember he was left out of the team (something that remains a mystery to outsiders), but now, it seems, Peter is right back in favour. The main question is: who’s no. 5? The list is long, and from the most likely to the least likely it looks as follows – Andreikin, Nepomniachtchi, Vitiugov, Tomashevsky, Morozevich and Jakovenko. phisey: At the end of 2013 has a vaccine for cheating still to be invented? A vaccine exists but it’s rarely used. I mean a short delay in a tournament’s live broadcast, metal detectors at the entrance, the option of searching the players and so on. The fact that cheating scandals continue suggests the problem hasn’t yet reached the level where chess society… Or else that tournament organisers and FIDE officials couldn’t care less about the problem. It’s all kinds of trouble – and there’s no revenue whatsoever. Valchess: Your assessment of the ACP’s performance in 2013? Tournaments are being held under the auspices of the ACP and it periodically participates in important debates on chess life. So the assessment is good, but no more. АркадийХ: What problems arose for the development of chess in 2013? vasa: Sergey, what, in your view, is the MAIN problem for modern chess, and has any progress been made towards resolving that problem this year? The main problem is that we’re incredibly far from the people chewing pop-corn. In general, getting things to work steadily is incredibly difficult. It’s even harder to escape from the internet onto TV screens. That breakthrough is what we all need. vasa: In 2013 we somehow didn’t hear anything about Chess960… Has the bubble burst? It wasn’t a bubble, of course, but it burst. Experience has shown that no chess-like game can compare with the popularity of normal chess. vasa: Which off-the-board event had the biggest influence on chess in 2013? The cunning manoeuvres of Mr. Paulson. Fortunately Ilyumzhinov and his comrades managed to minimise the damage. All of a sudden the unsinkable Paulson became the President of the English Chess Federation recently. I hope he won’t manage to sink the frigate. kambodja: Sergey Yurevich. I finally watched all your reports on the Shirov-Dubov match. First of all – a huge thank you for that commentary – it just flies by! The format itself is very interesting. Does something like that cost a lot? Is it realistic to expect businessmen to make a financial contribution to such events more often? Were all sides satisfied with how the match was held (including the merchant/philanthropist)? Thanks for the "thank you". Yes, it’s an expensive luxury – many thousands of dollars. In order for businessmen to take part in such events we need to come up with an angle for them other than patronage. Commercials advertising their goods? I don’t think the return would be noticeable. In the current situation where live commentary is only watched by a few thousand viewers the advertising effect would be small. All that’s left for those handing out money is a love of chess. As for the Dubov-Shirov match – in terms of how it was broadcast and covered in the media we did everything we could, and in that regard Oleg Skvortsov was satisfied. Only the final result was a disappointment. But sport is sport – anything can happen. Regulus: Which opening variations would you recommend playing full-time in order to pose as many problems as possible to your opponents, based on ideas used at the top level over the last year? And what’s your personal opinion about playing systems of the King’s Indian Defence with Black. How popular has that been among top players in the last year and what are its prospects at the highest level? I’ve already answered the first part of the question in "nominations for 2013". And overall, it’s possible to pose practical problems everywhere in an over-the-board game. Remember Andreikin – Kramnik, Nizhny Novgorod (Russian Championship Superfinal) and Nakamura – Kramnik, Antalya (World Team Championship). Dima and Hikaru managed to trouble the world’s best theoretician, and in his favourite variations! It was enough to use something a little rare – and a real struggle ensued. Any decent deviation from the main lines will be even more effective against weaker opponents. The King’s Indian Defence is, alas, unpopular nowadays at the highest level. Apart from Radjabov it has no constant adepts. Grischuk dabbles with it from time to time, but he doesn’t persist, while other notable players only rarely try the King’s Indian Defence. But on the other hand, that’s very good for those who do play it! People who are used to following the elite will book up on other openings, but you can play the KID, where there’s no doubt still a lot left to discover. It’s also nice that computer programs still continue to have a poor understanding of many King’s Indian positions. Their evaluations are often misleading. vasa: Sergey, which opening has bored you most this year as a commentator, and why? The Berlin Defence, of course! That’s no doubt something that’s built up over many years, but it was also a fresh impression. I was very glad to see the move 1.d4! in the ninth game of the match in Chennai, after which instead of the Berlin torment we got a full-blown, fascinating struggle with attacks on opposite wings. That was a gulp of water after a drought. WinPooh: The engine of the year? Mustitz: Which new engines have appeared and how do you rate them? For almost the whole year I continued to use the good old Houdini 1.5a and 3.0. It was only approaching December that I paid attention to new programs. Houdini 4.0 made a good impression but it now has a strong rival in the form of Komodo TCEC. I’m not yet sure which of those is better, but I can recommend both programs. I spent a few days working with Stockfish and came to appreciate its analytical powers. Офисцер: Sergey Yurevich, it’s no secret you use computers when analysing or commentating on games. Is it your view, then, that computer programs made any noticeable progress this year? And do you think the dominance of one well-known program (Houdini) has come to an end, as the World Champion this year was Komodo? Yes, Houdini’s reign is over. That’s a fact. And a very pleasant one. Competition will benefit everyone and spur programmers on to new advances. Rom: Do you, or any other grandmasters, use the tactical mode in Houdini when analysing (it’s available in the engine settings from version 3 onwards). If yes, then in what situations do you switch it on? No, Rom, I don’t change the engine settings. I do a great deal of analysis in my life and I’ve got no energy left to dig around in the settings. Moreover, in many important positions it’s hard to grasp what’s more important – tactics or positional factors. It’s simpler to increase the search time a little. I can’t speak for other grandmasters. Each to his own. vasa: A question on engines. Which test position (just one) should you use in order to clarify whether an engine is good or not? Or does no such position exist? Mustitz: In the last TCEC World Championship match there were more decisive games in the Komodo – Stockfish match than the Houdini – Stockfish match. Is that somehow related to the choice of opening variations? Or to something else? That’s not for me to judge as I don’t specialise in studying programs. Perhaps Komodo is more aggressive than Houdini? vasa: Chess books of the year? Which chess books have you read lately? Which would you like to mention (the best, the worst)? Unfortunately I haven’t kept track of all the books published this year. I was previously frustrated after some purchases – so I lost enthusiasm. But after getting these questions I again went shopping. I bought one or two things and had a look at some others. The number of new opening books is impressive. Those working on them include Sakaev, Bologan, Dreev and Barsky. Their tomes can be used as reference guides and provide a good starting point for analysis. The only problem is the ideas and plans behind opening systems aren’t always explained in a detailed and accessible fashion. Nowadays it’s become very fashionable to publish workbooks – collections of tactical puzzles and positional exercises. Among the new releases I’d single out John Nunn’s "Chess Puzzle Book". I also liked Valeri Beim’s "How to Calculate Chess Tactics". Adrian Mikhalchishin and Oleg Stetsko’s "Chess Endgame Technique" is another good book with useful examples. Particularly worthy of attention is Yury Yakovich’s "Sicilian Middlegames. Attacking on Opposite Flanks". That will unquestionably be beneficial for all Sicilian players, although the theme itself is so wide-ranging and complex that it’s impossible to fully cover in one book. I hope Yakovich will continue his work in the years to come. I didn’t come across an absolutely best book of the year on the shelves. That might have been a book with a detailed account of the Candidates Tournament in London, but so far there isn’t one. vasa: Chess site of the year? The Russian Chess Federation website. It’s making real progress! The only proviso is that they shouldn’t have changed the address of the site so suddenly and crudely, as that meant all the old links were lost. I hope they’ll soon be restored. When there’s a choice I’ll answer. Valchess: Chess publication of the year? Interview? All Dmitry Kryakvin’s historical digressions – a real treat. I don’t recall any interviews. Michael-13: Best photographs of the year? Magnus in the swimming pool! Valchess: Chess journalist of the year? Any new names? For example, it was a revelation for me to see the wonderful commentary of Pavel Maletin – his analysis of the Anand-Carlsen games was an event. And for you? Yes, Maletin’s annotations were deep and of a high quality. I hope Pavel continues his investigations. Valchess: We can conclude that the press has started to write more about chess, which is obviously linked to the energetic activity of the RCF’s new PR director Kiryllos Zangalis. But does that quantity convert into quality? Some feel there are too many publications of a PR type, while quality articles with a critical analysis of problems and how people (including RCF officials) have performed barely exist. What do you think? I think what matters here are the positives. For the last two decades people wrote little and badly about chess. Some improvement is now visible. Zangalis is one of those deserving of our thanks for that. Converting quantity into quality is something for the future. It’s also important to take into account that for the non-chess media high quality is the last thing they’re bothered about when publishing something about chess. More important for them are speed, accessibility, local colour, scandals and other indicators of mass consumption. Quality is a matter for the specialist media. MS: ChessTV is undoubtedly the event of the year for chess journalism. Something tells me that such projects can’t hope to be self-sufficient. I’d like to know more about the sponsors, team and plans. That "something" is right. For now, and it’s unlikely to be just for now, the process is very expensive. We don’t have any sponsors. There are tournament organisers who are interested in fully-fledged coverage of the playing process and allocate money for it, but others aren’t interested. Just recall the World Cup in Tromso. The Norwegian organisers wouldn’t meet us half-way even in trifles, and all the negotiations hit a brick wall – we were forced to create a surrogate for the live broadcast in our Moscow studio. ChessTV is a small part of the company Digicast October, which is based in the old factory buildings which in Soviet times were known by the name "Red October". Unfortunately chocolate is no longer produced there. Our plans, frankly speaking, are all up in the air. We only have a few rough ideas. The tournament in Wijk aan Zee will probably be compressed into a few videos by me. We’ll show Zurich in full. That’s already been agreed. We’ll work all-out in Khanty Mansiysk, both filming and commentating the way it should be done. Anything else is still uncertain. We’ll wait and see. phisey: All over the world live broadcasts are limited to a maximum of 1.5-2 hours, but ChessTV broadcasts last a whole game, which can often be a very long time to maintain viewer interest. Wouldn’t it be better to make highlights programmes that are an hour to an hour and a half long? Yes, the live broadcast of a serious game is hard for all concerned, including the viewers. But how can you make a two-hour broadcast of a 6-7 hour game? It’s absolutely obvious that for the TV format rapid chess and blitz are much more appropriate. Then you’ll get dynamism and concentrated action. For now, though, the importance of rapid chess is noticeably lower than that of classical games and those at the FIDE time control. All the important titles are contested in slow chess. We’re simply forced to produce long live broadcasts. As for highlights shows, they’re extremely necessary and important, and they shouldn’t be set against live broadcasts. One doesn’t rule out the other. In the same way after important football matches shown on TV you nevertheless have round-up programs with video highlights, a discussion of what happened and so on. That’s how it should be in chess as well. Given that few will have watched a live broadcast in full, after all important games it’s essential to distil the key moments of the games into a video. That’s why we didn’t produce video summaries of the match in Chennai. ChallengerSpy: You were always in favour of commentating on games in a "human" style, just using the comp to look up an opening database. ("No, I agree it was unnecessary to use engines as it was more important to show the human reasoning" - in your KC-Review of the Anand-Gelfand match, 2012). However, at the end of the last year you started to use engines constantly during live commentary on games. - Is that an experiment or a final decision? - Do you hope for feedback (for example, through a vote at ChessTV) ? - Which factors influenced your opinion on the effectiveness of using our silicon friend/enemy? It’s also important to understand that when, for instance, you’re covering a title match it’s essential that you quickly, on the very same evening, give the viewers an idea what actually happened in the game i.e. to give concise and sufficient information at the end of the broadcast. To summarise what happened. Doing that confidently without the help of engines is impossible. In general, there’s no clear-cut solution to that problem, and I assume different approaches will be tried from tournament to tournament. Using computers in the opening, if such a technical possibility exists (when there are few games, or even better – only one), is undoubtedly beneficial. The usefulness of engines during independent play by the players is something I decide based on the circumstances. As for public votes – you could first arrange one on the KC forum. It’s up to you! Eriksson: Sergey Yurevich, in the past there was live commentary in text format, and it was possible to download the games as PGN files with brief comments. Now the information is mainly given in video format. Undoubtedly that’s a good format, but for an average person it’s often very hard to watch classical games that go on for hours. Given that’s the case, I have the following question: how would you value your work producing short comments in PGN format? The PGN file itself, as I understand it, is produced automatically during the broadcast. I don’t know about anyone else, but personally I’d be ready to sacrifice a small sum in order to get detailed analysis from you. Those PGN files are later very convenient to analyse and use as a framework for opening preparation. Your question essentially comes down to the question about video highlight shows. It’s perfectly possible to combine such shows with files that contain brief and sensible analysis of the games. We sometimes did that here at crestbook.com in the past. But now, working for ChessTV, I’ve somehow let that slip. We produce very few video round-ups… Well, in future after producing videos I’ll also try to put some files up on the site. But using computer help during long live broadcasts, and then after that sitting down and editing all the raw variations that I looked at during a game… Where can anyone find the time and energy for that? After such long and hard work even a small additional burden is hard to bear. It’s possible, of course, simply to give people the resulting file without any editing, but which writer would print his rough drafts? That’s fundamentally flawed. As for "how would you value" and "ready to sacrifice a small sum", then first of all thank you for the offer, but such an approach doesn’t yet make any practical sense. The number of subscribers would be limited, and I can’t take on such a responsibility. Forgive me. Mustitz: During broadcasts it’s standard only to show the evaluation of one engine, including on ChessTV. Wouldn’t it be more interesting to show a few such evaluations? There are more things in heaven and earth, Horatio. But how can you put it all on a small screen? The very fact that during the match in Chennai we managed to include a small computer evaluation on the screen (without showing the program name) was good. It’s not obvious that more is required. It’s dangerous to overload the picture with information. I think you can find the answer in Evgeny Surov’s work. When it comes to interesting things around the margins of chess he’s your best bet. - How would you rate the work of the Crestbook site and the KasparovChess forum in 2013? It turned out I worked intensively for ChessTV. Therefore I no longer had any time for the previous live text commentaries for the site, never mind for analytical articles. However, I don’t think it worked out so badly, as after all, almost all the broadcasts could be watched here at Crestbook. Overall, the site is working in a low gear. We’re writing news and adding links – that’s the main thing. The forum is living its own life. People are talking, arguing and sharing news. Everything’s normal! Aprilla: Sergey Yurevich, what do you think about ending the year 2013 for crestbook.com with a simultaneous display on ChessPlanet for forum regulars who aren’t professionals? Let’s say with 7-10 boards. Naturally, if those players are in favour. I’m in favour. Both now and in future. Блаженный _Поэт: What can we expect overall from chess in 2014? Above all, I’m anticipating August in Tromso. Both the Olympiad and the FIDE Presidential election will be incredibly tense. And of course there’s also the fight for the World Championship title: Khanty-Mansiysk in March and the match between the new challenger and Carlsen in the autumn. But overall I hope the new tournaments, including those like the Alekhine Memorial that only appeared last year, will become traditional. I await the emergence of bright young talents and some changes among the elite. Pavel_L: Your prediction for the 2014 Candidates Tournament? Will Anand play? Who’ll win? No-one can predict Anand’s mood, but it nevertheless seems to me he’ll play in the tournament. But he won’t win… I’ll risk going for Aronian. vasa: A question ahead of time: will the Russian men’s team win the 2014 Olympiad? Земляк из Мурома: Sergey Yurevich, what do you think would be the optimal line-up for the Russian men’s team. Kramnik, Grischuk, Karjakin, Svidler, Nepomniachtchi. tru: Sergey Yurevich, will Chess TV be a paid service in the foreseeable future? There are no such plans. I hope we can also survive when it’s free for viewers. ProstoTak: What are the prospects for the growth of chess boxing and how do you feel about it? For now the prospects are very modest. It’s a young sport without any serious money. If it managed to attract serious investors then chess boxing could really be launched. But for now the level of the fighters is low, particularly when it comes to chess. On the other hand, the process is already interesting to watch. In that regard chess boxing makes an attractive show. And therefore it has potential. Commentating on it also turned out to be a piece of cake. On 28th November 2013 I really didn’t have any problems in the ring. We got off to a good start. Офисцер: Sergey Yurevich, does the path of chess to the "broad masses" lie through chess boxing, broadcasting rapid and blitz tournaments or through politicising the sport (as in Soviet times)? What’s necessary (in your professional view) so that at least 30% of the world’s population knows the name of the chess World Champion? I suggest combining all possible methods. I’m not even afraid of politicising it. At the end of the day chess being a cause for pride for particular countries is a normal phenomenon. Johnny Depp and Leonardo DiCaprio will be nervously smoking on the sidelines, observing the triumphant rise of a new star. Michael-13: Can you say something about chess players doing coaching work? For example, about Motylev’s coaching (and/or your own)? There are strong players, but can you talk about strong coaches? Unfortunately Alexander has started to play so rarely that we’ve forgotten about him as an active player. But he’s a wonderful coach. A strong analyst. Wonderfully! The cat keeps me fit. You can’t get lazy with him around. He wakes me in the morning and invigorates me in the evening. Spending time with Lis strengthens my nervous system. He’s an ideal anti-depressant. Whatever happens in life you just need to mess around with a cat and all the problems take a back seat. Alexander Valov (kit) - layout. Translated from Russian by Colin McGourty (mishanp). "KC-Review of 2013 with Sergey Shipov (in Russian)". "KC-Review: Experts on the Candidates Tournament 2013". "KC-Review of 2012 with Sergey Shipov"